Peter Collins appeared in three episodes of CBS Radio Mystery Theater. The picture you have for Peter Collins is wonderful...but it's not correct. 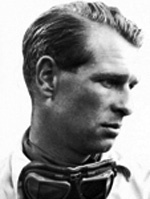 That is Peter Collins the Formula One driver, and he died in an accident in the German Grand Prix 1958. I believe you're looking for Peter C. Collins, who was a well-known character actor on Broadway, TV and in film. He passed away in 2004.